↑ Haribabu B, Hook SS, Selbert MA, Goldstein EG, Tomhave ED, Edelman AM, Snyderman R, Means AR (Sep 1995). "Human calcium-calmodulin dependent protein kinase I: cDNA cloning, domain structure and activation by phosphorylation at threonine-177 by calcium-calmodulin dependent protein kinase I kinase". EMBO J. 14 (15): 3679–86. PMC 394442 . PMID 7641687. 1 2 "Entrez Gene: CAMK1 calcium/calmodulin-dependent protein kinase I". Yokokura H, Picciotto MR, Nairn AC, Hidaka H (1995). "The regulatory region of calcium/calmodulin-dependent protein kinase I contains closely associated autoinhibitory and calmodulin-binding domains". J. Biol. Chem. 270 (40): 23851–9. doi:10.1074/jbc.270.40.23851. PMID 7559563. Liu F, Thompson MA, Wagner S, et al. (1993). "Activating transcription factor-1 can mediate Ca(2+)- and cAMP-inducible transcriptional activation". J. Biol. Chem. 268 (9): 6714–20. PMID 8384217. Chin D, Winkler KE, Means AR (1998). "Characterization of substrate phosphorylation and use of calmodulin mutants to address implications from the enzyme crystal structure of calmodulin-dependent protein kinase I". J. Biol. Chem. 272 (50): 31235–40. doi:10.1074/jbc.272.50.31235. PMID 9395448. Hsu LS, Tsou AP, Chi CW, et al. (1998). "Cloning, expression and chromosomal localization of human Ca2+/calmodulin-dependent protein kinase kinase". J. Biomed. Sci. 5 (2): 141–9. doi:10.1007/bf02258368. PMID 9662074. Matsushita M, Nairn AC (1998). "Characterization of the mechanism of regulation of Ca2+/ calmodulin-dependent protein kinase I by calmodulin and by Ca2+/calmodulin-dependent protein kinase kinase". J. Biol. Chem. 273 (34): 21473–81. doi:10.1074/jbc.273.34.21473. PMID 9705275. Anderson KA, Means RL, Huang QH, et al. (1998). "Components of a calmodulin-dependent protein kinase cascade. Molecular cloning, functional characterization and cellular localization of Ca2+/calmodulin-dependent protein kinase kinase beta". J. Biol. Chem. 273 (48): 31880–9. doi:10.1074/jbc.273.48.31880. PMID 9822657. Matsushita M, Nairn AC (1999). "Inhibition of the Ca2+/calmodulin-dependent protein kinase I cascade by cAMP-dependent protein kinase". J. Biol. Chem. 274 (15): 10086–93. doi:10.1074/jbc.274.15.10086. PMID 10187789. Hayashi Y, Nishio M, Naito Y, et al. (1999). "Regulation of neuronal nitric-oxide synthase by calmodulin kinases". J. Biol. Chem. 274 (29): 20597–602. doi:10.1074/jbc.274.29.20597. PMID 10400690. Hosaka M, Hammer RE, Südhof TC (1999). "A phospho-switch controls the dynamic association of synapsins with synaptic vesicles". Neuron. 24 (2): 377–87. doi:10.1016/S0896-6273(00)80851-X. PMID 10571231. Komeima K, Hayashi Y, Naito Y, Watanabe Y (2000). "Inhibition of neuronal nitric-oxide synthase by calcium/ calmodulin-dependent protein kinase IIalpha through Ser847 phosphorylation in NG108-15 neuronal cells". J. Biol. Chem. 275 (36): 28139–43. doi:10.1074/jbc.M003198200. PMID 10874031. McKinsey TA, Zhang CL, Lu J, Olson EN (2000). "Signal-dependent nuclear export of a histone deacetylase regulates muscle differentiation". Nature. 408 (6808): 106–11. doi:10.1038/35040593. PMID 11081517. McKinsey TA, Zhang CL, Olson EN (2001). "Activation of the myocyte enhancer factor-2 transcription factor by calcium/calmodulin-dependent protein kinase-stimulated binding of 14-3-3 to histone deacetylase 5". Proc. Natl. Acad. Sci. U.S.A. 97 (26): 14400–5. doi:10.1073/pnas.260501497. PMC 18930 . PMID 11114197. Hsu LS, Chen GD, Lee LS, et al. (2001). "Human Ca2+/calmodulin-dependent protein kinase kinase beta gene encodes multiple isoforms that display distinct kinase activity". J. Biol. Chem. 276 (33): 31113–23. doi:10.1074/jbc.M011720200. PMID 11395482. Condon JC, Pezzi V, Drummond BM, et al. (2002). "Calmodulin-dependent kinase I regulates adrenal cell expression of aldosterone synthase". Endocrinology. 143 (9): 3651–7. doi:10.1210/en.2001-211359. PMID 12193581. Sakurada K, Kato H, Nagumo H, et al. (2003). 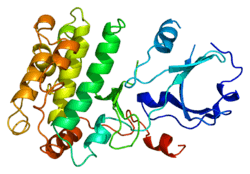 "Synapsin I is phosphorylated at Ser603 by p21-activated kinases (PAKs) in vitro and in PC12 cells stimulated with bradykinin". J. Biol. Chem. 277 (47): 45473–9. doi:10.1074/jbc.M206673200. PMID 12237306. Clapperton JA, Martin SR, Smerdon SJ, et al. (2003). "Structure of the complex of calmodulin with the target sequence of calmodulin-dependent protein kinase I: studies of the kinase activation mechanism". Biochemistry. 41 (50): 14669–79. doi:10.1021/bi026660t. PMID 12475216.